"On Monday the 14th of May 1804, we left our establishment at the mouth of the river du Bois or Wood river, a small river which falls into the Mississippi, on the east side, a mile below the Missouri, and having crossed the Mississippi proceeded up the Missouri on our intended voyage of discovery." So begins the first entry in the first journal published about the Lewis and Clark Expedition. The writer, thirty-three-year-old Patrick Gass, was one of the Expedition's oldest participants, and would live to become its oldest survivor. 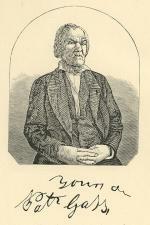 Born on June 12, 1771 at Falling Springs, Pennsylvania, Gass was raised on the Pennsylvania frontier, moving with his family to Uniontown, Catfish Camp (now Washington, PA), and Mercersburg, where he learned carpentry. In 1792, Gass joined a company of rangers on the Virginia frontier and was a sergeant in the Army in Kaskaskia, Illinois when Lewis and Clark came looking for volunteers in the Fall of 1803. Lewis and Clark were extremely careful in their choice of volunteers, choosing only one from every hundred who applied. They wanted "stout" and "healthy" frontiersmen in top physical condition, men "capable of bearing bodily fatigue in a pretty considerable degree," for Clark knew well that "a judicious choice of our party is of the greatest importance to the success of this vast enterprise." Impressed by his carpentry skills and frontier experience, they chose Gass to join the expedition. When the expedition finally set out from Saint Louis, eleven of the thirty-five volunteers were from Kentucky, where Lewis and Clark did their most intensive recruiting. Seven were associated with Pennsylvania, including Gass, Hugh McNeal, George Gibson, John Newman, John Boley, George Shannon, and Peter M. Weiser, a descendent of frontier diplomat Conrad Weiser. Jefferson had been very clear about the importance of documenting the expedition. Lewis and Clark would keep the expedition's official journals, but they also requested that others keep diaries. Seven other members of the expedition did so, including Gass, who had not learned to read or write until he was an adult. Gass began his diary on May 14, 1804, the day the expedition left its winter camp at the junction of the Missouri and Mississippi. During the next three years he was remarkably responsible in writing in his entries, the only lapses taking place when he was constructing canoes or building Camp Dubois and Fort Mandan. When the expedition returned from the West in late 1806, Gass settled in Wellsburg, Virginia (now West Virginia), and arranged to publish his journals with the help of Pittsburgh bookseller David McKeehan, who turned Gass" original field notes into a readable story and supplied "such geographical notes and other observations as I supposed would render it more useful and satisfactory to the reader." In the spring of 1807, McKeehan hired Pittsburgh's Zadok Cramer to print Gass's Journal of the Voyages and Travels of a Corps of Discovery. By early summer, the American public was able to read the first book-length account of the Expedition, which included Gass' detailed accounts of Indian-made dwellings and an unforgettable recipe for bear that he learned from the Nez Perce tribe. Unhappy at being beaten to publication by his former sergeant, Lewis warned the public that Gass's journal and other unofficial publications - including a bogus narrative of the Expedition printed in Lebanon, Pennsylvania - were incomplete and inaccurate. The Expedition's official history, edited by Nicholas Biddle, would not appear until 1814.) But publisher McKeehan defended himself in the Pittsburgh Gazette, arguing that "Mr. Gass" Journal did not fall into the hands of some wag." And, in fact, Gass's book was remarkably accurate and entertaining. In Philadelphia, publisher Matthew Carey issued three editions; the last of which was illustrated with the first images associated with the Expedition. Within a few years, European editions of Gass's Journal were available in English, French, and German. Born on the Pennsylvania frontier five years before the signing of the Declaration of Independence, Patrick Gass died at the age of ninety-nine in 1870 - five years after the end of the American Civil War, and two years after completion of the Transcontinental Railroad made it possible to travel from St. Louis to the Pacific Ocean in under three days. Donald Jackson, "The Race to Publish Lewis and Clark," Pennsylvania Magazine of History and Biography 85:April (1961): 163-177. Carol Lynn MacGregor, The Journals of Patrick Gass: Member of the Lewis and Clark Expedition (Lincoln: University of Nebraska Press), 1986.